Reserve yours now and the MamaTENS unit will be sent by post directly to your home to arrive 3 weeks before your due date. The standard hire period is 4 weeks, but if you notify us before the end of this period, you get a further 2 weeks at no extra cost. We reserve the right to levy additional hire charges should a unit not be returned at the agreed time. We also reserve the right to charge for repair or replacement costs should a unit be returned damaged or broken beyond repair. Our rental units are for the exclusive use of the hirer. We can only accept a reservation cancellation prior to the dispatch of the hire goods. Once hire goods have been dispatched, even if they are not used, the hire charge cannot be refunded. 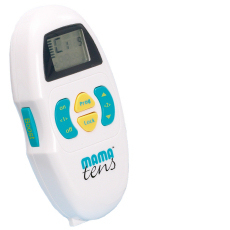 "The MamaTENS unit was so simple to use, and really effective"
"My NCT class recommended the MamaTENS and I was certainly glad I used one"
Boots TENS Rental is operated for boots.com by TensCare Ltd. The Boots & MamaTENS goods you rent or buy from this website will be rented or purchased directly from the manufacturer, TensCare Ltd.